A friend of ours sent us a copy of an artists drawing in a childrens book about bridges. It showed a design for the Golden Gate bridge that had been produced in 1923 but not built. The artist had added a Zeppelin going over the bridge. We of course approve of the sentiment! But it got me wondering about when Zeppelins had entered the consciousness of the American public enough that it would be considered perfectly normal to assume a Zeppelin flying over a landmark bridge. 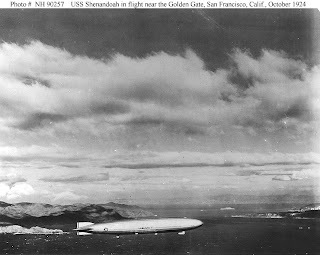 The first Zeppelin flying in the USA was the US Built Shenandoah. She was commissioned in September 1923, so it was a little prophetic to have one in a 1923 picture! She did actually visit the Bay Area the following year, and this picture is from October 1924 with her flying outside the Golden Gate, sans bridge. The Navy acquired a German built Zeppelin, renamed the Los Angeles, in 1924 and she occasionally made trips west. But it would be August 25, 1929, when the first commercial passenger airship, Graf Zeppelin entered the Bay through the Golden Gate.